We recommend a lot of music here; some of it you have heard, some of it you have not. One band that you've probably not heard of is Bosse-de-Nage, and that's really a crime, because they're very original and unique. They play black metal, but a weird style of it that no one else is doing. Their debut CD, which was released by The Flenser just over a year ago, was a standout release, and now The Flenser has stepped forward to release their second album, simply titled ii, and it is up for preorder now. Since I've not heard this yet, I let Mr. Flenser speak for the release: "This is the follow up to minimalist black metal weirdos Bosse-de-Nage’s self titled debut. 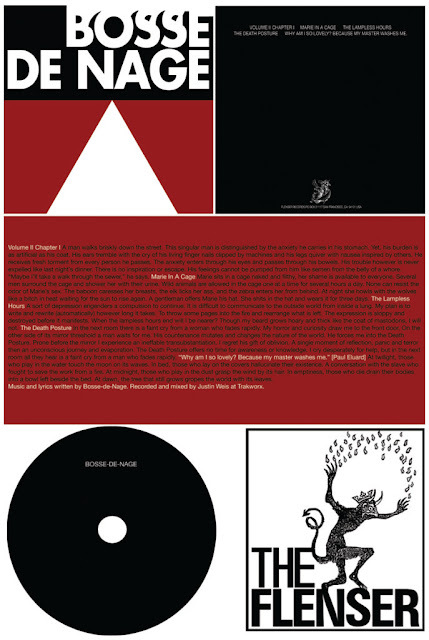 This album was recorded in 2010 by Justin Weis and features a HUGE sound along with the Lousiville-styled post rock (think Slint not Godspeed) and black metal weirdness that made Bosse-de-Nage’s debut a divisive genre defying classic. This is black metal, but black metal tinged with 20th century minimalism and outlandish vocals." Uh, yes please. Thank you. The vinyl, pictured above, is limited to 250 units, the first 100 of which will be on white wax. It is specifically mastered for vinyl. The CD, like the vinyl, is specifically mastered for its format, and features different artwork, which you see above. You can order them each individually, or you can order them together for only $5 more than the vinyl itself. Do it now.